What I will do is talk about the countryside in which they are grown... For is is because of the Vesuvius eruption of 79 CE, the geological even of which Pliney wrote of, which destroyed Pompeii as well as Herculaneum and half of Naples, that we have these effervescent tomatoes, today. That particular eruption dumped anywhere from 8 to 66 feet of ash for 80 miles in all directions. Most importantly, at least for tomatoes, was that this included what is now the province of Salerno in south coastal Campania. The high volcanic content of the soil is largly responsible for producing such astounding tomatoes. A testament to the old adage - When life gives you a pyroclastic flow, make tomato sauce. Um, yeah, or something like that, anyway. 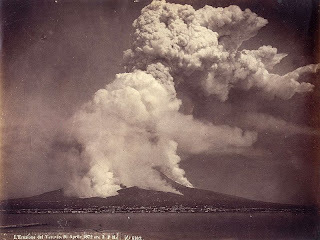 As seen across the Bay of Naples, April 26 1872 eruption. So I raided the cupboard and found Fire Roasted Tomatoes, which worked surprisingly well, I must say. Heat olive oil in a sauce pan over medium heat and add finely minced garlic and red pepper flake, cooking until the garlic just begins to brown. Add Tomatoes and a pinch or two of kosher salt and reduce heat to a simmer. Add Basil, Parsley and Mint; simmer for about 15 minutes. Drain the Mozzarella and set aside. Drain pasta, reserving 1/4 cup of the liquid, just in case. Add the Mozzarella perlini and the Pecorino Romano. Though I like mine plain.... Delectable! I love the way the mozzarella begins to melt and get all kinds of gooey, releasing it's liquid to bring a milky flavor to the dish that cools the heat of the red pepper flake and takes the edge off the acidity of the tomato. It's awesome! So, doom makes tomatoes better. Who knew? Heh. That pasta looks amazing, but not something I would expect mint in. Definitely have to try it out. That's my favourite pasta :)))), or better a favourite combination, I also love it with potato gnocchi. This looks amazing and hats off to your photos- they are all great and account for every step (I am so bad about that). sooo....should I find some sort of soil additive thats rich in volcanic ash to my garden this year? (wonder if Home Depot carries such a thing). I'm loving those wads of melty cheese!! Awesome Shane!..I could taste it now..what a great marriage of flavors.